A year ago Colin introduced me to this place, but I couldn’t figure out how to get back to it. I have been here a few times — always in spring. Anyway, this is a great find. 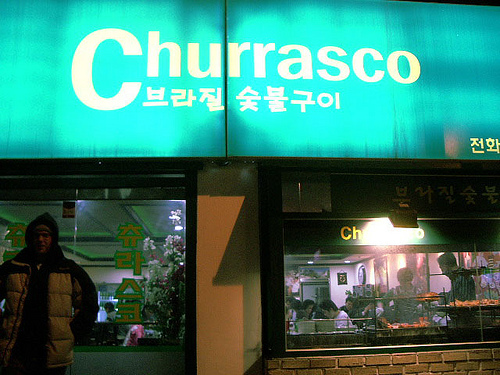 A Brazilian place in Anyang, just west of downtown. The best directions I can give is to take a taxi to Halla Apartments (“Halla Apah-tuh” í•œë¼ ì•„íŒŒíŠ¸). It’s across the street from them. If you’re going by car, going north towards Seoul, take a left at the light after the big CGV building. A couple of kilometers later, it’s on your left. Look for the green sign. Keep in mind that the menu’s prices are per person. They are graded by the amount of meat you get. You go for a higher price, you get a larger variety of meat. I have always gotten the 16,000 won set, and it has been more than enough meat for me and my carnivorous dining buddies. 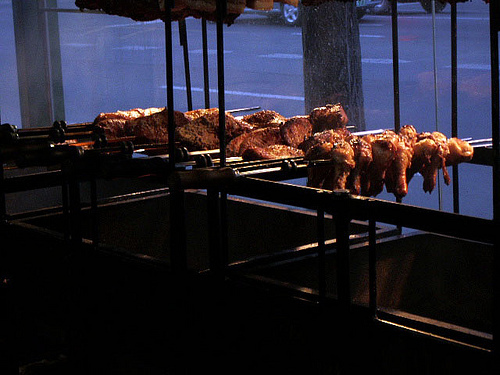 All the meat is cold smoked then roasted on a spit with minimal seasonings — really, just salt. The condiments are different salads and relishes, in particular a fiery bowl of sliced Korean peppers in oil and a bowl of Brazilian vinaigrette (what we would call “salsa” or “pico de gallo”). The meat comes in stages. 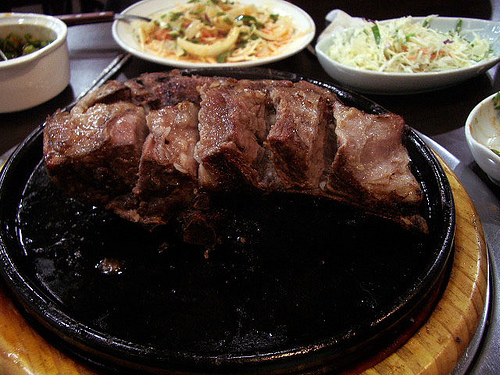 In the 16,000 won deal, we start off with a juicy lamb. Then comes some good pork, pork belly, chicken, and whatever the grillmaster gives you, depending on what he has up and ready. Things have changed at the restaurant since last year. Good and bad. The bad — the paprika sausages have been replaced with hot dogs. Granted, though, it’s been a while since I’ve had a fire roasted weenie. The good — unlimited buttery bread is provided, which I felt was missing before. There also seems to be a larger variety of sides. The potatoes are a hit. They are roasted below the other meats so that their juices help flavor them. The service is okay. The owner, the grillmaster, is always manning his grill wearing a necktie. The lone waitress, I assume his wife, is a bit gruff and short. It’s part of the atmosphere. The spread is somewhat Koreanized. 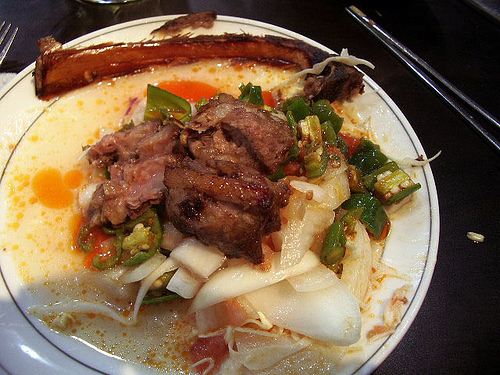 A doenjang Chinese cabbage soup is served with the meal. The clientÃ¨le, though, are fairly steady. I have never seen the restaurant empty. There have always been a healthy amount of tables filled. It seems to be popular among the locals. That is promising in an area where there are only four choices for non-Korean food: Koreanized Japanese, Koreanized Chinese, Koreanized pizza, and Outback. And did I mention all the freakin’ meat? With all that animal protein and fat coating my throat, I can swallow razor blades after a sitting. Update: I finally introduced Eun Jeong to this place. She actually was curious about it since her British co-workers were asking her how to get there. She has fallen in love with the place. I didn’t know she could pack down this much meat. This time, we showed up around 5 or 5:30. By the time we left, there were only a couple of tables free — all locals. This has got to be the best kept secret in Korea. Also tried their caipirinha. It’ll knock you on the floor. But it tastes like a cool breeze on a sunny beach.